Molly Bloom (@immollybloom) is an entrepreneur, speaker, and author of Molly’s Game: The True Story of the 26-Year-Old Woman Behind the Most Exclusive, High-Stakes Underground Poker Game in the World. What Molly Bloom learned by running underground poker games for some of the world’s wealthiest and well-known. The psychology Molly used to control the games — and their players. The secrets of generating rapport and trust among those who aren’t in the habit of trusting anyone. The strategies Molly utilized to become indispensable to her players. How Molly got involved in the world of poker in spite of unlikely beginnings, and what happened to make her quit it for good. Molly’s Game: The True Story of the 26-Year-Old Woman Behind the Most Exclusive, High-Stakes Underground Poker Game in the World author Molly Bloom didn’t set out to run the most celebrated game in town, get taken down by the FBI, or have a movie made about her experiences, but here we are. In this episode, Molly shares the business and psychology lessons she learned over eight years of running these underground poker games, why she took responsibility for her actions instead of selling out her former clientele when the FBI showed up on the scene, and what she’s looking forward to next. Listen, learn, and enjoy! Hover knows that every great idea deserves a great website domain name, so it provides you with this clean and simple service with human support and no upsells! Go to hover.com/jordan to get 10 percent off your first purchase! 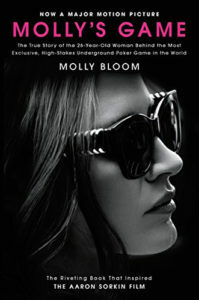 Before she lived the events documented in her book Molly’s Game: The True Story of the 26-Year-Old Woman Behind the Most Exclusive, High-Stakes Underground Poker Game in the World, Molly Bloom had been a straight A student and Olympic-class skier from Colorado. So what led to her rise and eventual fall in the underground poker circuit? One brother went on to become a Harvard-educated cardiothoracic surgeon, and the other is a two-time Olympian and the youngest freestyle skier in history to be inducted into the United States Skiing Hall of Fame. Even after undergoing painful surgery and being told she would never ski again, Molly persevered to make it all the way to the Olympic qualifiers until a freak accident took her off that path for good. “I was in my last year at University of Colorado,” says Molly. “I’d done extremely well on the LSATs — I had a 3.9 GPA and I was headed to a future of law school. I just wanted to take a year off before becoming super serious again. I went to L.A. and needed to get the first job that I could. I got hired by this guy who was a pretty demanding boss; I was his personal assistant. One day he said, ‘I need you to serve drinks at my poker game.’ I googled ‘What kind of music do poker players like to listen to and what do they eat?’ Very professional and sophisticated! Listen to this episode in its entirety to learn more about what Molly did to stay in the room, the tactics she learned for navigating her shady boss’ impossible requests, why Hollywood in particular is such a ripe environment for making people feel like they don’t matter, how Molly was able to use her high-stakes poker games as a trojan horse for networking and infiltrating any subset of society, the psychology Molly used to control the games — and their players, the secrets of generating rapport and trust among those who aren’t in the habit of trusting anyone, the strategies Molly utilized to become indispensable to her players without appearing obvious or needy, Molly’s observations on the power of fear, celebrity quirks you’re curious about even though you wish you weren’t, and much more. Click here to thank Molly Bloom at Twitter!